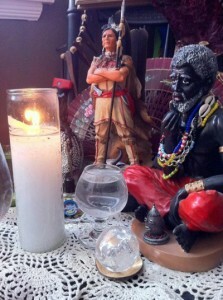 One of the most colorful aspects of the Santeria faith is the way in which we work with spirits of the dead. Traditionally speaking, the Lucumi/Lukumí way of honoring the dead takes place around the offering of cooked foods, prayers, libations and drumming ceremonies to the spirits of ancestors by blood or spiritual lineage. These ancestors are called Egun, and the center of ancestral worship is the opá ikú (staff of the dead). Around the opá ikú ebós and offerings of food, candles and libations are left for the ancestors. While the worship of egun has always been alive and well with the Lucumi/Lukumi people, there is not a very strong practice for working with guiding spirits – Ará Orún (spirits not of ancestral lineage – spirit guides). 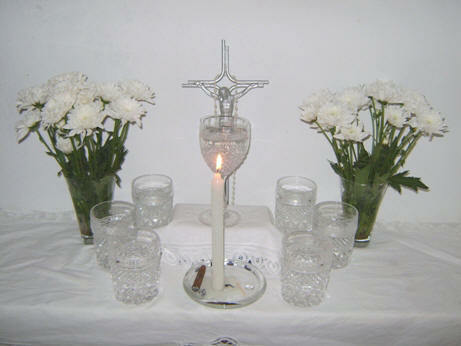 Thus began the introduction of Kardecian Spiritism (Espiritismo) into Santeria Lucumi/Lukumi. Within the ritual structure of Kardecian Spiritism, participants are called mediums and work toward development of psychic abilities, perception of spirits, communication with spirits, and transmission of their messages either through channeling or through direct possession. Kardecian Spiritism places a heavy emphasis on the use of Catholic prayers during the spiritual mass (misa espiritual) or seance as a way of creating a divine protective presence while the mediums make themselves open and vulnerable to the spirits. Traditional Kardecian Spiritism became very popular in the mid to late 1800’s as the author Allan Kardec began publishing his books on spiritism. His message was originally intended as a way of cultivating spiritual awareness within the elite members of society, but the elite only engaged in spiritist masses and spiritual seances as a parlor game for entertainment. Sadly, his message of spiritual enlightenment and development of mediumship was lost on the elite classes. His work, however, was embraced by the slaves, the poor and the working class. Espiritismo grew incredibly popular in Cuba during the Ten Years War, 1868-1878, (which later moved into the Cuban Independence War). During the Ten Years War, Cuban military leaders used misas espirituales to communicate with the spirits of deceased soldiers in order to reveal enemy troop movements and to identify whether beloved family members had died in battle. At the same time, Cuban military leaders were also engaging the assistance of Paleros (priests of the Congo-Cuban religion Palo Monte) for magical charms to protect their troops, defeat their enemy and to gain advantage on the battle field. By engaging both Espiritistas and Paleros, a curious blend of spiritism evolved in Cuba as a result: Espiritismo Cruzado. Espiritismo Cruzado literally means “crossed” or “hybridized” Spiritism. Espiritismo Cruzado still utilizes the traditional prayers and ritual structure of Kardecian Spiritism, but it also incorporates many elements from Bantú (Congo) religious practice including the use of spirit dolls to represent spirit guides, the smoking of cigars, drinking of rum and other spirits, the use of herbs to cleanse people, the use of perfumes and other potions to cleanse or bless those present, and the channeling and African-style possessions of mediums by spirits including Congo slaves, former priests in either Palo or Santeria, or even possession by the spirits of the dead worked within the ritual context of Palo (Nfumbes). Espiritismo Cruzado is notably African in nature and traditional Kardecian Spiritists wouldn’t even recognize its practices. The center of religious worship in Espiritismo Cruzado is the bóveda. The boveda is an altar usually made on a table or a shelf, covered in a white cloth, upon which 7 or 9 glasses of water have been placed. Typically there is a central larger glass that represents the medium’s main spirit guardian. In addition to these glasses of water it is common to find a crucifix, a rosary, flowers, images or statues of saints, or dolls depicting male or female slaves, gypsies, indians, nuns, or other spirits. Many espiritistas will also keep offerings to their spirits on the table like cigars, perfumes, fans, handkerchiefs or other items. Mediums will gather at the bóveda typically once a week to recite catholic prayers, saint prayers, prayers asking for assistance and protection, and prayers for the development of their mediumship skills. The kinds of spirits commonly contacted within Espiritismo Cruzado are a blend of the typical guide spirits contacted through conventional Kardecian Spiritism (Gypsies, Pirates, Indians, Asian masters, elevated spirits like saints) with the kinds of spirits worked through Congolese spiritual work with the deceased (congo slave men, madama type spirits, or dark spirits needing assistance or seeking work). These are usually not ancestors of blood nor of initiatory lineage (Egun), these are spirits of the dead or citizens of heaven called Ara Orún (sometimes mistakenly called Ara Onú). These spirits seek to work with people as guides, guardians or agents for magical spells. It is also common for practitioners of Espiritismo Cruzado to work with the Seven African Powers – which are not orishas, but are actually seven different spirits unique to that individual medium; one from each of the seven tribes of people brought to Cuba in the slave trade. When spirits possess their mediums, they enter into their mediums in a very African style of possession. These are distinguished by the spinning, jumping or thrashing about of the medium as the spirit enters that person’s body. Once fully possessing the body of the medium they often share drinks, smoke cigars or request specific clothing that they want to wear. Some spirits recommend spiritual cleansing or spells for those present to perform in order to better their lives. Occasionally the spirits themselves will take possession of a medium and spiritually cleanse another person by passing herbs over the body, whisking perfume-laden cloths across a person’s aura, or by spinning the person receiving the cleansing (to lift their malady off of them). These are very African experiences of possession in direct comparison to the types of possession you will see in a Kardecian Spiritist gathering where mediums typically remain seated, shake a bit, and trance out in order to dictate wisdom to those present for a period of time. While most Santeros are also Espiritistas who practice Espiritismo Cruzado it is important to note that Espiritismo is a foreign import into Lucumi/Lukumí practice. It is not native practice within Santeria and most importantly, it is not a requirement to practice Santeria, although 99% of Santeria practitioners do participate in Espiritismo. Some houses (spiritual lineages) make the mistake of saying that it is a requirement for people to do spiritual masses before becoming a priest in Santeria – this is not true. It is not required, but it is a good idea just in case any issues arise within that person’s spiritual court prior to initiation. Espiritismo Cruzado is not a fundamental part of Santeria but it does do a lot of good. It helps aleyos experience possession and it gives them a spiritual practice to begin cultivating prior to any initiations, because anyone can work with spirits of the dead (initiation is not required to do it). In modern times, more and more Santeria lineages are moving away from the practice of Espiritismo Cruzado as they embrace a more Lucumí/African way of worship. This is a further example of the Catholic syncretized elements of Santeria making their way slowly out of the practice of Santeria. What’s the Difference Between Legba, Eleggua, Eshu and Exu?! © 2019 Santeria Church of the Orishas.